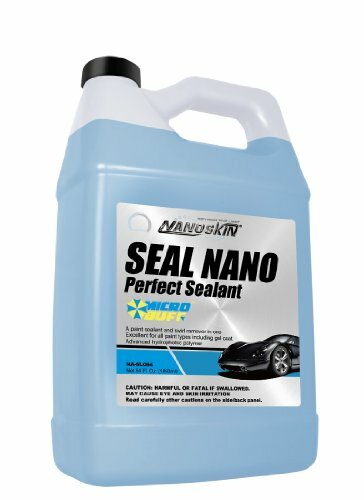 Nanoskin NA-SLO64 Seal Nano Perfect Sealant - 64 oz. Nanoskin Seal Nano is a synthetic paint sealant and swirl remover in one. This revolutionary new product combines the paint-correcting abilities of a polish with the durable protection of a nano paint sealant. Excellent for all paint types including gel coat, Seal Nano provides relentless water beading and durable protection against UV rays, bug splatter, and anything else nature throws at your vehicle or boat on a daily basis. To achieve optimum result, apply Nanoskin Seal Nano Perfect Sealant with Microbuff Finishing Pad to remove gloss-hindering defects while leaving a durable layer of hydrophobic protection behind. If you have any questions about this product by Nanoskin, contact us by completing and submitting the form below. If you are looking for a specif part number, please include it with your message. Sonax 243400 Spray and Seal - 25.36 fl. oz.